Growing grapes and making wine - no matter what part of the planet we are from, this is a way of expressing how people work together and lend each other a helping hand in the natural environment. Autumn is the season for harvests. So, I went and visited "COCOROMI-GAKUEN (A school with a challenging spirit)" and "COCO FARM & WINERY" known for creating exquisite domestic wine. It is located in Ashikaga in the Northern Kanto region, an area that was unrenowned in the past for being a producer of grapes and wine. It was 8 years ago when I first visited the COCOROMI-GAKUEN and COCO FARM & WINERY. After passing through the main street in the urban area of Ashikaga, fields of rice and vegetables begin to appear. Then you will suddenly see a steep mountain side whose slopes are covered by carefully groomed vineyards that continue all the way up to the peak. I remembered being very impressed by finding a vineyard in such a place. I have been in love with COCO FARM ever since my first experience of the Harvest Festival at COCO FARM. The wine, the vineyards, the bright blue sky, smiles of the students?c It is quite difficult to fully describe to my friends what is so enchanting about the farm. I just felt from the very beginning that this place was somehow different, somewhere very special. Many COCO wine fans came to the Harvest Festival. Every one looks very happy and seems a bit tipsy! The COCOROMI-GAKUEN is a rehabilitation facility for mentally challenged adults who are members of the social welfare corporation, Cocoromirukai. People who live at the facility or commute to it have opportunities to receive training about working and about life in general so that they may live independently one day. And the COCO FARM & WINERY is a limited company incorporated in 1980 with the investment from parents and guarantors of the students enrolled at the school. In terms of the business structure, the COCO FARM & WINERY commissions the cultivation of grapes to the COCOROMI-GAKUEN. I decided to visit Ashikaga this time so that I can get a closer look and experience for myself what structure they employ that makes it possible to create high quality wine highly acclaimed even among wine lovers. I also wanted to learn about what special considerations, if any, have been taken in terms of business management policy. The steep-sloped mountain on which you will find vineyards was first cultivated in 1958 by Mr. Noboru Kawada, the principal of the school, who was back then a teacher for an orthogenic class. He and his students cleared the land so that his students can really learn by actually working on a task. They cut trees in order from the peak down, and brought fertile soil from a dry riverbed of the Watarase River, and planted grape vines, which all required a huge amount of work. In 1969, Mr. Kawada established the COCOROMI-GAKUEN with his peers. They had realized the limitations of the state of orthogenic education and welfare. Mr. Kawada and his staff became engulfed with the work at the vineyard and in the forest while living with mentally/physically challenged children. This produced excellent results: a child who did not show any signs of improvement elsewhere became very lively at the school, or there was another child who could not walk before began pushing a wheelbarrow about or carrying a log for growing Shiitake mushrooms well. Such incidents that surprised the parents and their former teachers continued to occur. Carrying a log for growing Shiitake mushrooms is also a very important task. The principal, Mr. Kawada, will turn 87 years old this year. He worked on the vineyard with his students until last year. Growing grapes or Shiitake mushrooms are not easy tasks. It requires experience, knowledge, skills, and physical strength. But we can experience great joy only when we repeatedly challenge and overcome such difficult tasks with gritted teeth. Such feeling of accomplishment could never have been experienced through existent teaching materials and programs. The students became confident about their life and work, and that helped them change considerably. 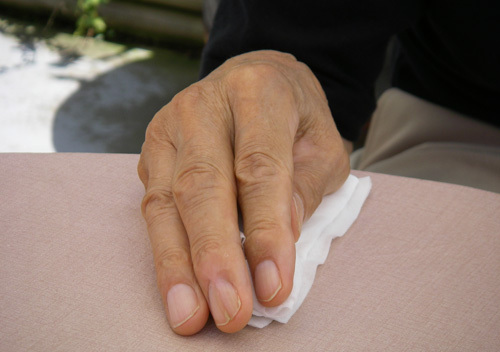 Mr. Kawada says, "My hands have become thinner by 30-40%" (but his hands still look big and very sturdy). The students who have lived here know everything there is to know about this mountain and the vineyard. They are sometimes asked by the local community to help thin trees. It is a great exchange of services as the owner of the mountain can have his property well maintained, and the students get a good deal on logs for growing Shiitake mushroom. Mr. Kawada says "Students come to the school with soft baby-like hands and graduate with hands of a farmer. But it's not only the hands, they also leave with a very robust spirit." Currently, the COCOROMI-GAKUEN has about 130 students - 90 regular students, 10 short-term students, and 30 other students who come during the day. There are always 7 or 8 staff members at the school, but they work so hard themselves amidst their students, you can't really tell them apart at a glance. At the school, all the students do their best to do what they can and support one another like one big family. There are students who take care of the grapes, bang on cans with sticks to scare away crows, mow grass, deliver logs for Shiitake mushrooms, cook the meals, do the laundry, clean the place, or enjoy the breeze? Mr. Kawada says that one of his sayings is, "The archetype of motivation lies in hunger," "it is important for people to work with motivation." Executive office leader Mr. Masaharu Sigh told me that there are 4 endurances at the Cocoromi-Gakuen. How great a glass of ice water tastes after a hard days work, or the warmth of the hot bath you take to refresh your tired body?c He explained that feeling such great sensations with every cell in their bodies gives people the vitality to "work hard again the next day!" Upon hearing this, I thought about how I spend my day, working as I sit in front of my computer, I felt a bit half-baked. Mr. Masaharu Sigh, the executive office leader of the school. Beginning of September - grapes that are harvested first at the vineyard were Riesling Lion, a must have for making sparkling wine. Riesling Lion is a hybrid grape created in Japan by bringing Riesling and Kosyu Sanjaku grapes together. Its vineyard lies on the upper portion of the mountain. On the day of the harvest, I climbed up the mountain to catch up with the students who were already up in the vineyard. Once I entered the vineyard from a farm road, I realized that the slopes were much steeper than I had expected. The incline seemed to be as steeps as about 45 degrees; it was so steep I had to get on all fours at times to climb up. By the time I finally reached the students, I was perspiring and heaving for breath. A student who spotted us reporters asked, "Do you want to try one?" and gave me a freshly harvested Riesling Lion. It tasted absolutely exquisite! Even though the students were working very hard, they spoke to us very cheerfully saying "Hello-" and asking us, "Where are you from?" Riesling Lion shines emerald green. The harvest was done in 2 groups - 1 was in charge of cutting the grapes off from the vine, and the other group gathered and delivered them to containers. Most of the students silently went about their work, but at times, some students sat and rested, played with the grass, hummed a tune, so the atmosphere was very tranquil. They worked across the row of vines, moving down to the next row once all the grapes were picked. Students' hollering, "Bring a container here please!" echoed throughout the vineyard. Students in charge of containers walk about with loads weighing nearly 10kg. Having gotten so used to the task, they carry it to the truck without any difficulties. The slopes are so steep you can easily lose your balance. So, even a task like this is a very difficult and tough one. Everyone has tanned, sinewy, muscular arms of farmers. According to the vineyard director, Mr. Takahiko Soga, "Many Japanese people still seem to think that you can only make good wine from renowned species of grapes." The COCO FARM, however, grows many grapes that are unrenowned in Japan, such as the Riesling Lion, which we mentioned before, the Muscat Bailey A, which are used to make their signature wine "Dai Ichi Gakusho (the first movement), Norton, and Tannat." They focus on growing grapes that best suit the weather and soil in Japan, rather than those that are widely recognized. （Left）The students thoroughly inspect the grapes one by one, and carefully remove blackened or cracked ones with scissors or tweezers. （Right）Since the aroma of Riesling Lion continues to change as soon as it has been picked, these grapes will be processed by next morning. （Left）Staff tastes the grapes while working very quickly. They are very dexterous! （Right）First, the clusters of grapes are weighed. Then each grape is removed from the stem while being counted. The stem will then be weighed and the data recorded. If you divide this by the number of grapes counted, you can get a ballpark figure of how big each grape is, and based on these figures, they can derive an estimate of that year's crops yield. Mr. Soga says, "Without the students, it would be impossible to invest so much time and to pay attention to such detail." As expected, COCO Wine only exists because of the students. Mr. Soga told me that he hopes to pursue higher degrees of excellence, creating wines with subtlety and finesse befitting of Japan. Mr. Bruce Gutlove, a managing director of the COCO FARM and also the brewing supervisor, is a brilliant technical expert who has worked as a consultant at famous wineries in Napa and Sonoma after having graduated from University of California in Davis majoring in zymurgy. Bruce told me that he had a hard when he first came to Japan because he didn't understand the language, culture or customs. He felt then that the students at the school were standing in the same shoes, and that he felt an emotional connection with them. Bruce says, "We are all on the same team." What do you think people overseas would say is special about COCO FARM? It is not easy to produce good grapes in Japan, but we make up for this shortcoming with our passion. Our staff has a disposition to create new traditions. Europe has over 1000 years of history making wine, and there is a sense of maturity or completion about them. It truly does take a long time to make great wine. The weather/climate and the food culture of Japan are completely different from those in Europe. We must seek the cultivation method best suited for Japan from scratch and create original wine. Our staff understands that well and works very hard. Of course the students do, too. Everybody comes to work the next day no matter how tired they are. They work hard no matter how hot or cold it is, or even if its raining. What would be special about our place? I would say that it is passion. It is top-class, something we can boast to the world. What do you think about the scale of your business? At present, we produce approximately 160,000 bottles of wine. We would probably only increase this amount to about 200,000 bottles at most. This is because the winery is here so that people can work with the students. If we increased production volume, we will be expected to give priority to efficiency and will be asked to make harder decisions. That's not something we want to do. As a company, would you say that you face challenges of keeping it small? In order to keep the business going without expanding production capacity, we need to create products of value as much as possible, and to make efforts to streamline the operation. I think trying to boost sales at the café and the store, rather than just sales of wine, is another strategy available to us. It is not easy to keep the motivation high, but my goal is "to do the job a bit better than the day before, and to make better wine than the year before." It is a exciting enough challenge. You have additional vineyards and contracted farm outside of Ashikaga? In Japan, there are vineyards and contracted farms in 14 locations, for example, in Hokkaido, Yamagata, and Yamanashi. I visit them right before the harvest begins and consult with the farmers about when would be the ideal time to harvest. To harvest fully ripened grapes, we ask them to limit the yield* and to wait as long as they can to harvest. Late picking is a great deal to ask of farmers because it increases the risk of diseases, especially when growing organic or pesticide-free grapes. In principle, we guarantee an income per dimensions of the vineyard, but I think my visiting them is very important. limit the yield* - The process of cutting away some grapes from the clusters before they ripen so that too many grapes on the cluster will not dilute the flavor. This helps concentrate the flavor in the grapes that are left on the stem. Bruce hopes to build a trusting relationship with the farmers by actually traveling to the vineyards all over Japan and by meeting and conversing with the farmers repeatedly. He is a man of integrity. I interviewed Ms. Chieko Ikegami - the director of the school and also the vice president of the COCO FARM. She is in charge of store layout and product development. She is Mr. Kawada's daughter and is very charming. The winery's café and shop are very lovely, and I have been looking forward to having lunch here even before I got here. （Left）The patio is always busy with people, even on weekdays or rainy days.（Center）The café menu's illustration has been done by Aiken Drum.（Right）Café's signature dish, "lunch plate." （left）With this tasting set, you can enjoy red, white, and rose wine.（Center/Right）Aprons, wooden bags, T-shirts are some items you will find at the store; these suit the atmosphere of COCO FARM. （Left）The portrait of Mr. Kawada by Shinbo Minami makes me break out into a smile.（Right）Different illustrators have created labels for the Last Supper series. They look like they would make perfect gifts. Back to Table of Contents The 3 "S"
What is the concept for your product development? We value the three "S," which are "Simple," "Symmetry," and "Chic" (it actually doesn't start with an "S," but it sounds like it does). One of the ideas we value is to beautifully accentuate the red color of the wine. If we were talking about architecture, we would try to incorporate and use the features of the materials such as steel, concrete, or stones. For example, we use plywood at our office but we don't paint it. I like the phrase "cheap chic," but the key is that we cannot afford to spend too much. The view of the patio from the vineyard. Is the concept of "work" here different from so-called wage labor? To work here means to offer comfort to everyone. Needless to say, it is a bit different from working for an hourly wage. The students' task is not like a job with regular office hours such as from 8am to 6pm, and the fermentation of grapes does not involve a 40 hours of work per week. For example, a spell of rainy weather isn't anyone's fault. We can't really say, "This just won't do." This is also true for having a disability. You can't blame anyone for it. Such complicated elements become intermixed here to create one thing. The vineyard on a rainy day. What is necessary to make great wine is perhaps such complexity, balance, and a long-lasting taste. Some wines come into their own only after they have aged properly. When we give the students a couple thousand yen as allowance, they spend it on our wine at a store downtown. For them, working is living. They do not think that they have to work; they take pride in the work that they do. You can't really produce quality work if you are thinking about loss and gain. Truly meaningful work is something you engage in emotionally. There is a student at the school, Mr. K, who loves a can of coffee more than anything in the world. No matter how many times you ask him, he will answer that he likes "a can of coffee" more than he would a million yen or a hundred cans of coffee. I love this conversation, so I tell everyone about it. This is because although we might have knowledge about how to save money or how to invest, we are beginning to lose sight of what is really important, such as "drinking a can of coffee and enjoying it." Do you think you have a good balance between welfare and business? The reason why we have established a limited company is because we were told that a wine making license will not be issued for a school. But a limited company can't make agricultural produce, so we commissioned the growing of grapes to the school. We just wanted to "make great wine and bring joy to many people," and the current structure is a result of compliance with the various laws and social systems. Therefore, I recently think that it is a little different from the concept of "balance." Fortunately, we sell a lot of wines, but we don't have a sales department. So how great the wine taste is extremely important. We would like customers to come to our café so that they can "drink great wine." A beautiful display of wine bottles. The lighting is also wonderful. We are often categorized as eco, organic in terms of the wine industry, or community business. But as long as people call us that, we are still amateurs. Whether we have anything to do with welfare or organic, that is something people can find out later. As professionals, it is not worth mentioning that we cover each cluster with an umbrella, or we thoroughly sort our grapes, or that we incorporate the latest technologies. These are all mixed into one. Mr. K is in charge of keeping an eye out for crows. He bangs on an empty can everyday, even if it rains or thunders, to scare them away. Mr. Kawada told me that "he sleeps with his stick." Whatever the task is, every one of the students has thoroughly mastered his/her task. Some students work in silence, others may be lost in thought, or may start working vigorously after awakening from a deep sleep, or may suddenly shout "I'm tired!" - everyone is very free, honest, lovable, and very humane. Ms. Ikegami asked me if I knew a winery in France called "Hospices de Beaune*." Ms. Ikegami is well versed in wineries all over the world and studies them well, like Bruce. From the business perspective, maintaining a moderate level of production volume may be a "challenge of keeping it small," however they never cease to think about ways for their vineyard and facilities to remain sustainable for 100, 200 years to come. * Hospices de Beaune:A medical charity established in 1443 by Nicolas Rolin, the Chancellor of the Duchy of Burgundy, at his own expense. They own a large quantity of vineyards that have been donated for the poor by the wealthy. It is now known as one of the greatest wineries in Bourgogne. The Mayor Beaune serves as an executive board member. Every year, their wine is offered in an auction and the earnings will be used to manage and maintain the facility. In Japan, the systems and laws for welfare have been changing rapidly in the recent years, but they say they never forget to question whether such rules on documents will truly make their students happier. While referring to the management strategy of public wineries, which does not exist in Japan yet, like the Hospices de Beaune, they continue to employ an earnest approach and take on challenges, so that the students at Ashikaga with mental and physical disabilities can live happily for a very long time. Graduated from ICU (International Christian University). She has worked for a local museum/news paper publisher before she became a freelance writer. In 2002, she became involved in publishing a book of record of government's cultural programs and became intrigued with the ideas and lifestyles in the various regions that are passed down from one generation to the next. In 2004, she launched the first issue of "Satomi Tsushin" which is formed around the theme, fixed-point observation of farms and farmers. Currently, she is a writer for "L'espace" and also serves as an editorial staff for the Earth News for Think the Earth Project. She lives in Takasaki. from Japan vol.65 2014.02.04 The power to build a new future. Let's make renewable energy more widespread! from Brazil vol.61 2012.07.26 A report from the conference that shapes our future, "Earth Summit 2012 Rio+20"